Joel Aiken, who has over 30 years of winemaking experience in Napa Valley, including 27 years spent at the iconic Beaulieu Vineyard, started this personal project in 2009 to offer site-specific Cabernet Sauvignon and Pinot Noir from special vineyards of character. 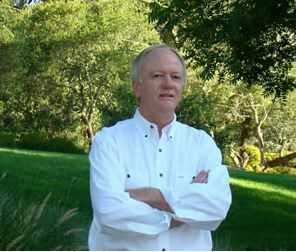 Joel had a remarkable career at Beaulieu Vineyard, rising to winemaker at the age of 28, and implementing many innovative winemaking techniques as well as conducting extensive Pinot Noir clonal research in the winery’s Carneros vineyards. For years, Joel worked side-by-side with the legendary André Tchelistcheff. Today, Joel produces wines for a number of clients including Amici Cellars, Rare Cat Wines and Chase Cellars, and along with his winemaker spouse, Amy, is proprietor of Palisades Wine Co. in Calistoga, where the couple make their wines. 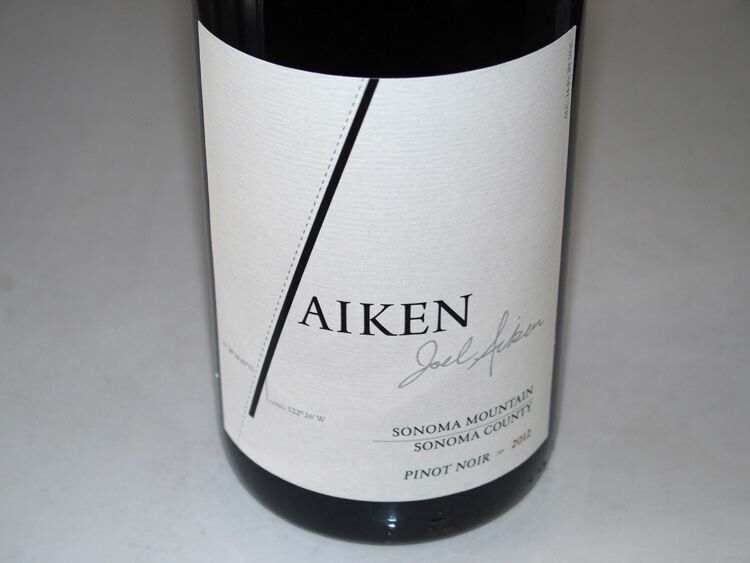 Visit www.aikenwines.com. Julia’s Vineyard Pinot Noir has been renamed Benchbreak Pinot Noir to recognize the vineyard source of the wine that is situated at a dramatic spot where the bench drops toward the Santa Maria Valley floor. New labels have been designed to capture the old vines and fossilized seashells that are the true essence of the estate. Some of the vines here have endured since the 1970s, thriving in the cool, maritime influences that funnel in from the Pacific Ocean, and allowing for the longest growing season in California. Since 2009, all grapes from the Estate Vineyard have been certified sustainable by the CCSW program. The vineyard has also been SIP certified since 2011. I have found in the past that the Julia’s Vineyard bottling is consistently one of California’s best value-priced Pinot Noirs. Visit www.cambriawines.com. 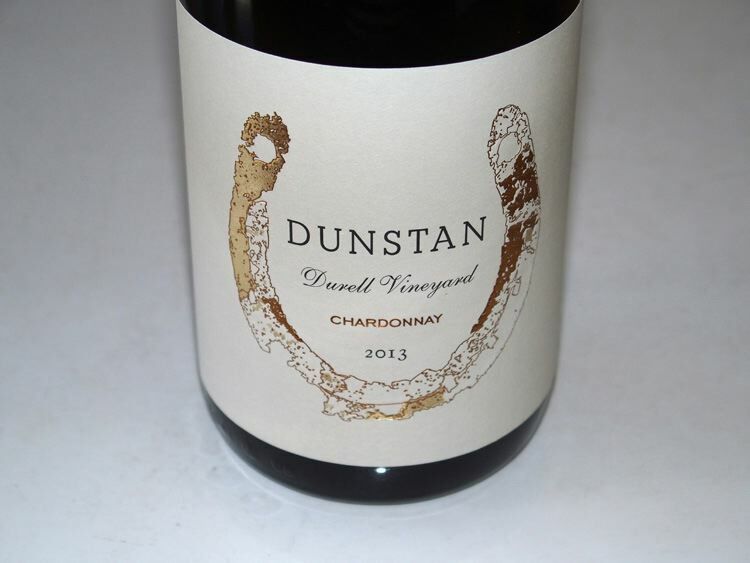 Durell Vineyard owner Ellie Phipps Price launched Dunstan Wines in 2008 with fruit sourced exclusively from the 8.5-acre Ranch House Block located at the heart of the Durell Vineyard surrounding the original ranch house on the property. Durell Vineyard is located in the southwestern hills of Sonoma Valley, straddling the Carneros, Sonoma Valley and Sonoma Coast appellations. Visit www.DunstanWines.com. Owner and winemaker Mike Faulk launched his brand in 2013 with these inaugural releases. The wines are a culmination of years of making wine in backyards, basements and garages. He left Florida in 2005 to further his winemaking goals, and now crafts his wines at a winery in Kenwood, CA. His inspiration is his grandmother, Engracia Perez Hernandez, a Cuban refugee who arrived in Florida in 1960. Grapes are sourced from longtime friend and grower Manuel Silva who owns Silva Vineyard. The winery’s website is www.engraciawines.com. 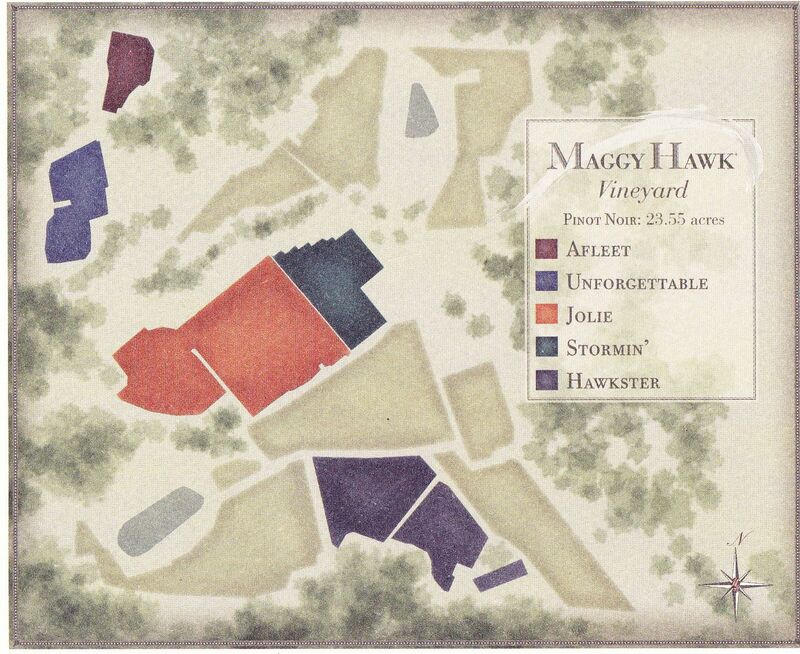 Maggy Hawk needs little introduction as I have written extensively about this deep end Anderson Valley vineyard and the extraordinary wines produced by winegrower Dennis Winchester and winemaker Elizabeth Grant-Douglas. The Maggy Hawk label was launched with the 2007 vintage and five block wines featuring primarily a single clone are offered. 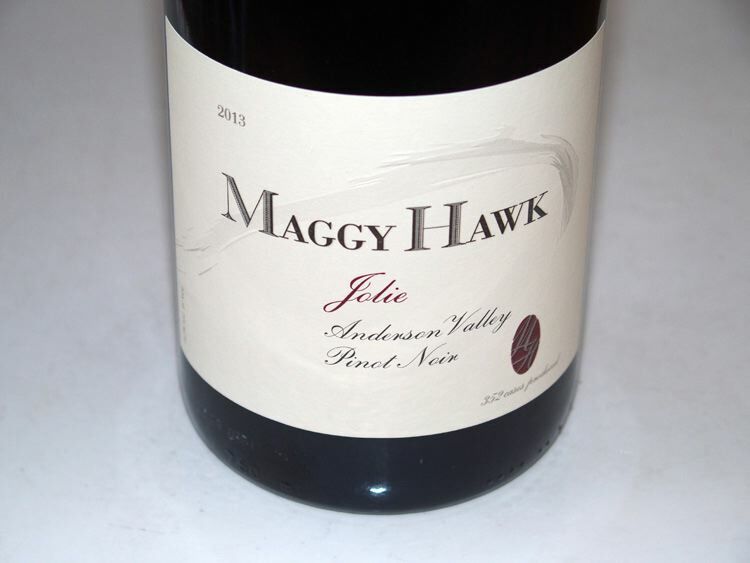 Each wine is named after champion racehorses born to Maggy Hawk that proprietor Barbara Banke (Jackson Family Estates) celebrates in these wines. The wines are sold through at mailing list at www.MaggyHawk.com. I believe these are among the greatest Pinot Noirs currently being offered in California. In this vintage compared to 2012, the wines have less color, less extraction and tannin and better acidity. They are more “classic” and well-balanced styled Pinot Noir. These wines will turn out to be more age worthy than the more showy 2012 vintage wines. Hard to pick a favorite among the lineup. Greg and Barbara Hill farm a small, picturesque vineyard, the Deep End Vineyard, planted to Dijon clones 114, 115, 777, and Pommard. The vineyard is located just west of Highway 128 in Philo in the Anderson Valley. Deny Dudzik is the vineyard manager and winemaker who consults with winemaker Phil Baxter, Jr. Visit www.nelsonhillwinery.com. 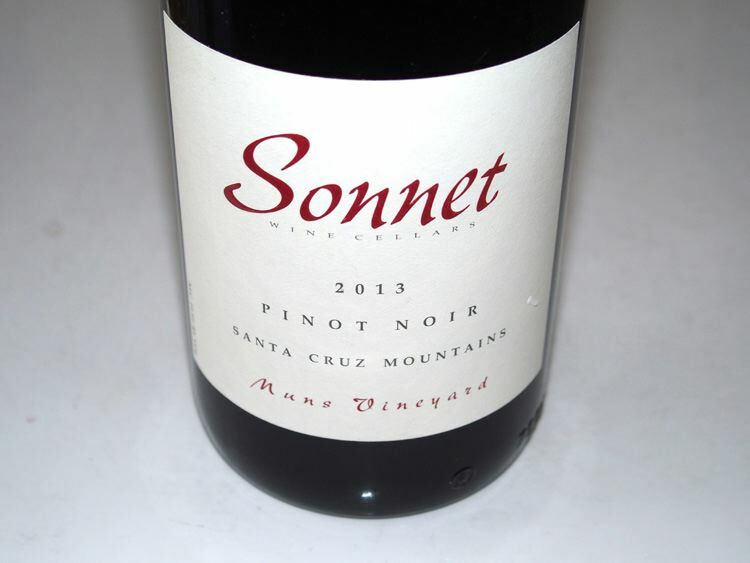 Sonnet is a small Santa Cruz Mountains producer of Pinot Noir founded by winemaker Tony Craig during his twelve-year tenure as winemaker for David Bruce Winery. A former Shakespearean actor originally from England, he was unable to find work as an actor after moving to California, and serendipity led him to answer a newspaper ad for a cellar worker at David Bruce Winery. He took to winemaking naturally, within 14 months was part of the winemaking team, and eventually became head of the vineyard-designate Pinot Noir program. He started the Sonnet Wine Cellars label in 2003, and now produces vineyard-designated Pinot Noir from Muns Vineyard in the Santa Cruz Mountains and Tondre’s Grapefield in the Santa Lucia Highlands. The 2013 Sonnet Wine Cellars Tondre’s Grapefield Pinot Noir won Red Sweepstakes and Best of Class awards at the 2016 San Francisco Chronicle Wine Competition. Tony also is the winemaker for Silver Mountain Vineyards, Muns Vineyard and Savannah-Chanelle in the Santa Cruz Mountains. Sonnet wines are sold through the former winery’s website with a link to www.silvermtn.com and through distribution to markets and retailers in the San Francisco Bay area. The Sonnet Wine Cellars website is minimalist and the wines are not sold directly at www.sonnetwinecellars.com, but don’t let that dissuade you from the excellence of the wines.